The neck is one of the two main sections of the banjo (the pot being the other). The neck is the long piece of wood that supports the strings and tuners. Necks are usually made of maple, mahogany, or walnut. In the world of fretting, you use the term up the neck to refer to moving the left hand toward the pot and down the neck when you talk about moving the left hand toward the nut and peghead. Fingerboard: A thin, flat, wooden strip glued to the neck that holds the frets and is the surface upon which the left hand produces notes and chords. Peghead: Also called the headstock, the peghead is the elaborately shaped end of the neck that holds the tuning pegs for the four lower strings of the banjo. Tuning pegs: Sometimes called tuners or tuning machines, these pegs are the devices that raise or lower the pitch of the banjo’s strings with a turn of the buttons located on the backside of the peghead. The pegs for strings 1 through 4 are attached to the peghead, while the tuning peg for the 5th string is found on the topside of the neck near the 5th fret. Comparing open-back (a and b) and resonator (c and d) five-string banjos. Nut: A block of ivory, bone, or plastic that’s glued to the end of the fingerboard where the peghead begins. Strings 1 through 4 pass through the grooves in the nut on their way to the shafts of the tuning pegs. The 5th string has its own smaller nut, located near the 5th fret. Heel: The name given to the part at the end of the neck that’s attached to the pot of the banjo. Truss rod: You can’t see the truss rod, but it’s an important part of most banjo necks. The truss rod is an adjustable metal rod that runs down most of the length of the banjo neck in a channel underneath the fingerboard. This rod helps to keep the neck stable and controls the amount of curve in the neck to keep the strings from buzzing when playing. 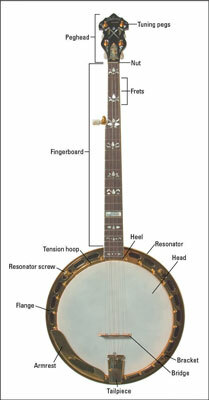 The parts of a banjo.